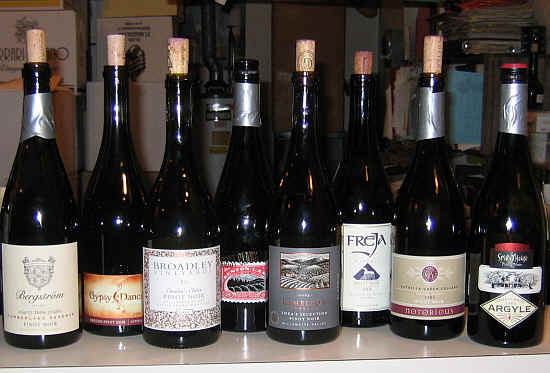 With the demand for Pinot Noir at an all-time high, we assembled a set of ambitiously-priced wines from Oregon. One participant suggested that I include a value-priced wine in the line-up, so I put a $20 bottle of Oregon Pinot alongside the rest of the high-priced field (those wines averaged a bottle price of $58!). 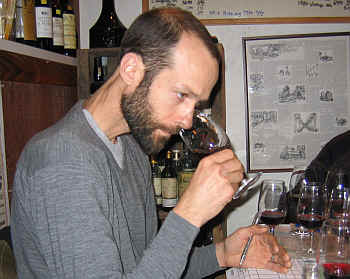 The wines were from the rather different growing seasons of 2005 and 2006. The 2005 vintage saw a winter drought, early-bud-break and then a rather cool summer growing season. The vintage was late and there were harvest-time rains which complicated the picking of the fruit and the vinification of the wines. On one hand, some call it a typical harvest scenario for Oregon. On the other hand, it's certainly a challenge for the winemaker. The 2006 vintage saw above-average levels of rain in the winter, which was fortuitous since the growing season was very dry. The harvest months of September and October saw an early heat spike and vintners had to work quickly to pick and process their grapes. The harvest season was more frenzied and shorter than usual. Yields in 2006, by the way, were larger than normal, but vintners say the quality was unusually fine. 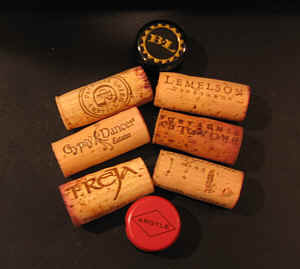 Our set of 8 wines was rather closely bunched in terms of quality. No real "dogs" and yet, thanks to a couple of controversial wines, nothing really ran away with 'top honors' in this line-up. Every wine in the tasting had at least one first place vote and every wine also had at least one last place tally! The wine with the greatest number of first place votes had NO second place rankings and yet it had the most last place votes! One critic described the Bergstrom Pinot Noir as "the most Burgundian wine of the tasting." An old-timer found it to be "typical of old-fashioned, one-dimensional Oregon Pinot Noir." A third critic blamed the grower, saying "the vineyard is at fault here more than the winemaker. There's unripe fruit and the wine is light and thin, with little in the way of production value. It's got a bit of a black tea note, but overall it's merely an insipid, light wine." 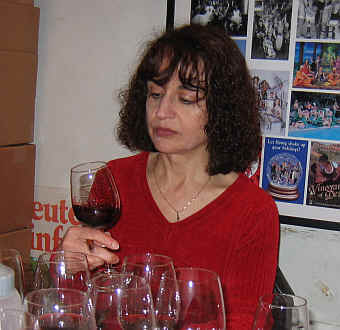 More pleased with the wine, one person detected "violets, strawberries and nice complexity with an earthy element." Someone else felt this needed additional cellaring, perhaps as long as ten more years. Showing light garnet color, the nose of this little wine was more redolent of strawberries and reminiscent of Beaujolais more than Burgundy. I found a mild woodsy hint to the fragrance here and a candied aspect to the nose. There's a pleasant berry tone on the palate and it seems a bit warm...or, at least, the alcohol shows some potency. The wine is fine as far as it goes, but it doesn't go to great lengths. I gave it a one-half a star rating on my three star scale, no stars being a standard or average wine. This was a very controversial wine. 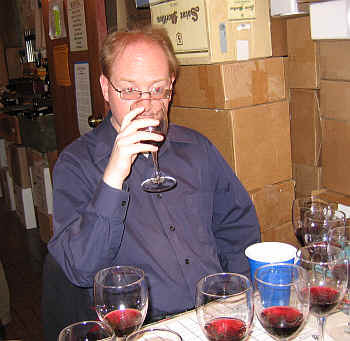 Some tasters were totally enchanted by the wine, while others were repulsed. One participant said "It started out really well and was appealing, but then it got worse." A second taster identified this as "My first place wine. It's a really cellar-worthy wine and young and tight. It will evolve in five to eight years. Very long finish, it's big...bigger than Burgundy, but balanced tannins." One taster didn't care for the tannins and found "cinnamon and cranberry" notes in the wine. Another critic said "I don't think it's going to get better with time. There's not sufficient fruit to warrant cellaring this. There's an off-putting plastics note and tones of smoked meat, charcoal and it's bitter and light." Someone else found it "lacking a core of stuffing." Another taster encountered notes of "white pepper and other interestingly complex notes, but too rubbery-scented. It's also very austere and tight. We might need ten years to find out if this is good." A final voice mentioned "raw and green tannins." I was on the fence over this wine. I initially was enchanted, but then thought the wine was a bit atypical of Pinot Noir. But in assessing the overall group, I finally gave it my first place vote as it was, to me, the most complex and interesting wine of the set. The color is medium+ garnet. The aromas display herbal Pinot fragrances with some charry, woodsy and forest-floor notes. As it warmed and got some air, I thought it veered towards cool climate Syrah. There's an intriguing spice element which I found very complex and in the direction of Burgundy and Rhone wines simultaneously. The wine is fairly full on the palate. Lots of spice flavors and it's a mildly tannic wine. I recently tasted a Guigal Cote-Rotie from about 30 years ago which had a similar spicy and herbal quality. It probably does need five to ten years of cellaring, but it's a most complex wine presently. If you don't mind that it's somewhat atypical of Pinot Noir, you may be enthralled by this wine. I give it two stars+...very complex, actually, but, obviously, not everyone's idea of Pinot Noir. One participant described this as having "sweet fruit on the nose, with red cherry notes. It shortened up on the finish, though." Someone else found it "aggressively herbaceous, with tomato stem fragrances. It's not Pinot Noir and the wine has particularly harsh tannins." Another person mentioned finding cola notes. Dennis pegged this wine as "Typical of Broadley Pinot Noir...the wine shows a spiciness there wines usually have. Strawberries and a spice note." One person described it as showing notes of "canned green beans." Echoing this sentiment, another person found "vegetal notes and bell peppers." 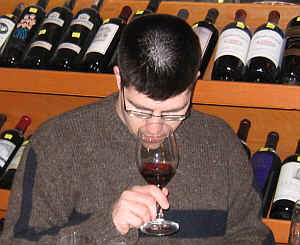 A final comment was centered on the wine having "an ugly after-taste." I found the wine to have a medium garnet color and a fruity, sweet cherry fragrance. It has nice cherry and vanillin notes with a woodsy, smoky and herbal undertone. There's a gamey element which is somewhat Burgundian in character. The wine is medium-bodied and lightly tannic with earthy, gamey and typical Pinot Noir flavors. I liked it...One and a half+ stars. It is nice now and can be cellared for three to eight+ years. "This is a zesty, berryish, cherryish Pinot Noir with a whole lots of oak. Woodsy flavors and lots of oak on the finish. Nice wine. Well made." said the lead-off batter. Someone else found it to be a "simple Pinot that's dressed up with a lot of oak." A third person described it as "having Pinot Noir character, but it was closed to start. Lots of oak, more in the fashion of a Cabernet." Someone else suggested the wine may be blended with something other than Pinot Noir. 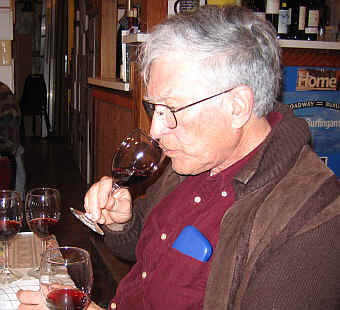 A final voice mentioned finding "consistent cherry fruit...it was my favorite wine." The wine had medium garnet color and light fruit...it was a bit quiet at the start and seemed to open up a bit. It inched in the right direction and the fruit was partnered with a considerable woodsy note reminiscent of pencil shavings. It's a medium+ bodied wine. Mildly tannic. This is a perfectly nice wine, but I can't predict if this will improve with aging or merely hold up for a few years. One star with three to five years of cellaring as a possibility. The first critic found an "odd musky aroma and baked blueberry cobbler. It's light and watery, though. I also found a hint of sweet cream." Another taster felt "this wine tries to be Burgundy, but in my view, it falls short." One taster said it has a "sulfury nose and some black tea flavors." Someone else found it to have a "funky nose." A final critic felt this "is the most early-maturing wine of the flight." Medium garnet in color, it's got nice, if light, hints of cherries on the nose and a touch of wood. The nose struck me more as "Pommard" than, say, Gevrey Chambertin or Nuits-Saint-Georges, for example. 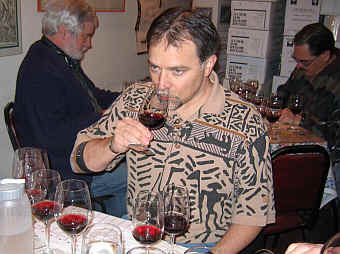 The wine has medium-full body and nice dark cherry fruit on the palate. There's some length to the finish of this charming red. It probably can go for three to six years in the cellar. I give it a one-and-a-half star rating. Nice wine and, given the prices of so many of these, this one carries a sensible tariff. One critic described this as "having clove spice notes and some raisiny elements." Another taster said "It's mighty tannic for such a small wine." Someone else found it "reminiscent of some Languedoc red wines such as Corbieres. There's a hint of a cherry cough syrup to this...it's like a ripe Syrah." More positively, another panel member found this to be "well-balanced with a nice finish. It's a really lovely Pinot Noir." I found medium+ garnet color with fruity, cherry notes on the nose along with a hint of cola and some brown spices. Medium-light bodied on the palate, it's got good Pinot Noir flavors. It might not be the most complex wine you could find, but it's rather nice, perfectly pleasant and shows typically varietal character. I liked the cherry notes on the palate. One-and-a-half stars with a couple of years of cellaring potential. I was glad to see if finish in the "upper division" since it's so reasonably priced! "My first place wine," intoned one critic, adding "it's incredibly good, well-balanced and it has a very long finish." Other tasters reacted negatively to a sulfur note. Someone else knocked it for "being low in acidity." "It's sulfury and stinky and has a note reminiscent of burnt brownies or burnt popcorn." Another person detected "a lot of cola and it has more 'impact' as there's a lot going on here on the palate." A final critic felt this was "very extracted, with sweet chocolate notes and it's bitter and sulfidey." I noted a light garnet color to this wine with really lovely fragrances of Pinot Noir and sweet, toasty oak. There's a perfume of baked cherry pie and nice, Burgundian style here. Medium+ bodied, it's a bit warm on the palate, with nice fruit and a touch of oak. Three to five years of aging potential, I gave it one-and-a-half stars. "This wine took a while to open up." said the lead-off taster. Another found it "sour and acidic." "Fruity and tartly acidic." commented someone else. One panel member questioned if this "was a little bit volatile?" Another critic found it to have "Nice fruit and mild strawberry notes and some minerality." Someone else said "It's got a great finish and is beautifully balanced." One person felt it "is higher-toned than the rest of the wines with a bit of orange, citrus character. It's dropped off in intensity on the palate, but I liked it." I found a medium-light garnet color to this wine with good, 'correct' varietal fragrances and a hint of a clove spice tone. It's a 'quiet' Pinot Noir, but a nice wine. Medium-bodied, its flavors echo the aromas...good, simple, correct, lightly cherryish and a perfect nice, if little wine. Too bad it carries such a hefty price tag! One star.